Deathmatch 2017: This aggression will not stand, man. Things have gotten real bad, real fast and I think it’s clear that we are living in times that will have large, detailed chapters in future history books. I awoke this morning to learn that a close friend of mine is now banned from entering the United States purely because of her place of birth. The wall is being built. A white nationalist is now sitting on the National Security Council. The nation built by the poor, the tired and the huddled masses is refusing to admit refugees. The most powerful office in the world is less trusted and respected after eight days of Trump than after eight years of George W. Bush. I confess that I am deeply afraid. As well as being afraid, I am angry, frustrated, appalled and sickened. But one thing I am not is despondent. I am not pessimistic. I am not disheartened. Because the last week has reaffirmed what I already knew. The American people did not elect Trump. Trump was elected by a combination of fluke, a rotting and archaic electoral system, voter suppression and intervention by a hostile foreign power. The American people are the ones who voted for Hillary Clinton by a massive margin, who staged the largest demonstration in the nation’s history against Trump’s nascent kakistocracy and who are now fighting against the illegal detention of refugees at American airports. The good outnumber the wicked and they always will. This is a time when all people of good will must put whatever skills they have towards resisting Trump. For me, that means writing snarky reviews of movies which I will be the first to admit is not the most obviously useful skill in an anti-fascist resistance movement. 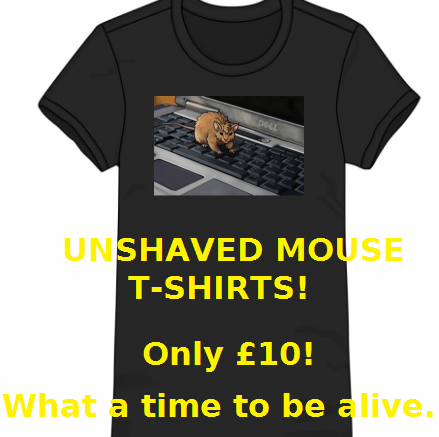 But that is why this year’s Unshaved Mouse Charity Movie Deathmatch is in aid of the American Civil Liberties Union. So, how does the Deathmatch work? Make a donation of $5 or $10 to the ACLU. Deathmatch runs all through February. Every two weeks, the lowest scoring three movies/series will be eliminated in ways not for the faint of heart or weak of stomach. Highest scoring three movies/series at the end of the month get reviewed and get to go home to their loved ones. Mouse, I’m wealthy, I’m charitable and I want you to review something NOW. A $35 dollar donation gets you any movie or episode of a TV show reviewed that you like. $60 gets you two. $100 gets you four and quite possibly a statue somewhere when this all blows over. What if I buy a review for a movie or series that’s competing in the death match? In the case of movies, if you give a $35 donation and request a movie that loses the deathmatch, you get the review anyway. If your movie wins the deathmatch then I will contact you and ask you for your second choice and you get two movies that you wanted reviewed instead of one. Fair enough? In the case of a TV series that wins the deathmatch, I’ll review an extra episode for every person that gave a $35 donation for that series. Boring stuff done, so let’s MEET OUR FIGHTERS!